ILLUSTRATION: NOAH KROESE: New Decagon Illustrations! 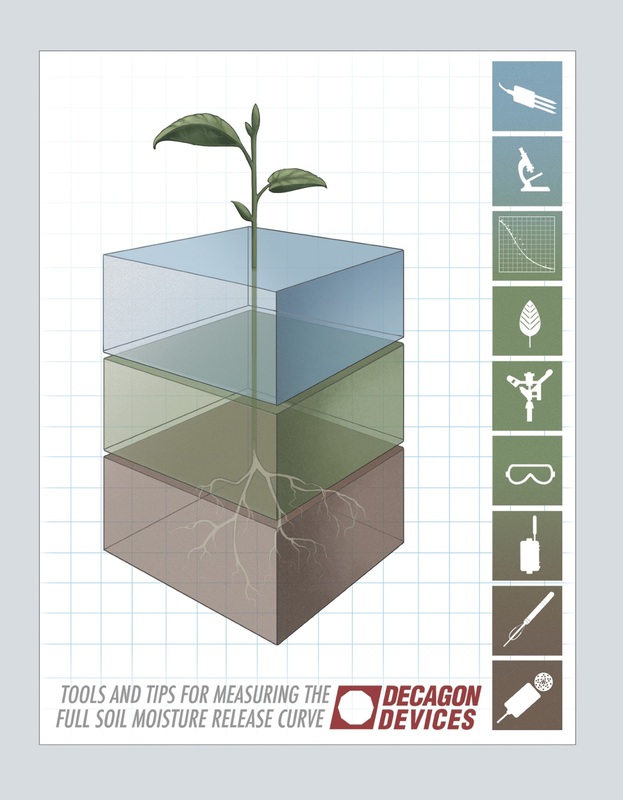 I was asked recently by one of the many good people over at Decagon Devices, Inc. to draft up a few concepts for an upcoming newsletter, the title of which is "Tools and Tips for Measuring the Full Soil Moisture Release Curve." That seems pretty complex, right? But after a brief explanation, the concepts involved didn't seem all that intimidating. That seems to be one Decagon's major strengths (along with creating a host of great products): They're able to explain processes, concepts and theories that seem extremely complex in a way that makes them accessible (even to illustrators). In a way, this is how I think of my job as well. More often than not, I'm asked to take a complex idea and distill it into a visual that accurately represents that idea. It's a process that involves design, imagination, a lot of thought, a lot of mistakes and a good deal of editing. In the end, that process is usually in service of communication. The illustration is a means of telling a story, communicating an idea or explaining a process. Sometimes there's an option/avenue/direction that's staring right at me and I never see it. Like when I'm at the grocery store and ask a clerk where some product is and I'm standing directly in front of it. It's a little embarrassing, but c'est la vie. On that first concept, I figured having that much white space would be a deal breaker (I'm probably more fond of white space than I should be). On the second concept, the shape of the art made placing some of the other elements a bit awkward. I thought it was a nice solution. I'm super satisfied with the way this turned out, but the assist credit goes to the peeps at Decagon. I chuckled when I saw this. As much as we'd like to take the credit, it's your genius that allows us to do what we need to do. Ken: At the very least, this one was a team effort. And it's always a pleasure to be part of the team.